Take your friends and guests to the ends of the earth and towards the most delicious flavors: Thailand! Want your guests to have a new experience, help them discover new flavors and take a trip? These 10 simple and authentic recipes will not fail you. 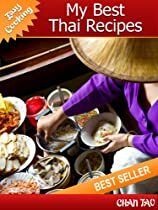 Amongst the best recipes, you’ll quickly discover the uniqueness that is Thai cuisine. The Thai people nibble at any time of the day. They meet a friend on the street, what do they do? They stop at the first table on the street side and start with a plate of chicken curry, pad thai or Tom Kha Gai (chicken galangal soup). Recipes with a thousand flavours, they will make you discover the subtle flavors and numerous aromas that you were perhaps unfamiliar to before. Far from exact science, these recipes have been handed down by word of mouth from generation to generation. Adding a drop of fish sauce, removing a pinch of red curry, Thai cooks adapt themselves in the kitchen to their mood. The recipes in this book give you exact quantities but do not hold them too strictly. Is this your first experience of Thai or Asian cuisine? Do not be intimidated, it is an art that respects your talents!